SpeedWords Arena is the high-speed game of interlocking words where everyone plays, and it's always your turn! SpeedWords Arena is a carefully designed and well-balanced game that will seriously challenge your skills as a quick-thinking wordsmith! Start with 7 letter tiles and make interconnected words from them as fast as you can. When you use all of your tiles, you get another, and another, and another! The faster you make words, the faster you get new tiles! 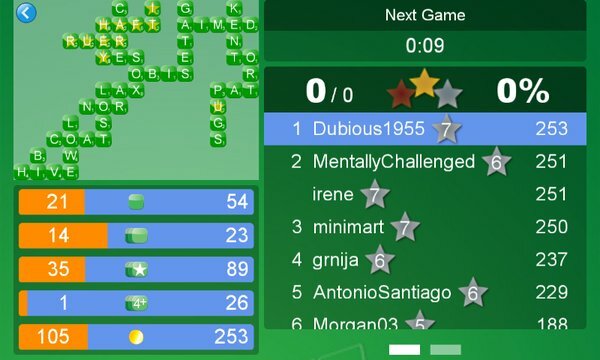 Every player is given an equal chance to compete using the exact same sequence of letter tiles to make the highest-scoring board of interlocking words before the round ends and scores are tallied. Choose your strategy: Go for maximum speed and lots of words, or carefully rearrange to make bonus star words. It's a tough call, and you'll have to make it under the pressure of a ticking clock! If you've got a few minutes to exercise your brain, come on in for a lightning round in the Arena!